If there were any broad change I could make to the hunter class (or really all the classes, for that matter), it would be to cut down on RNG for DPS purposes. 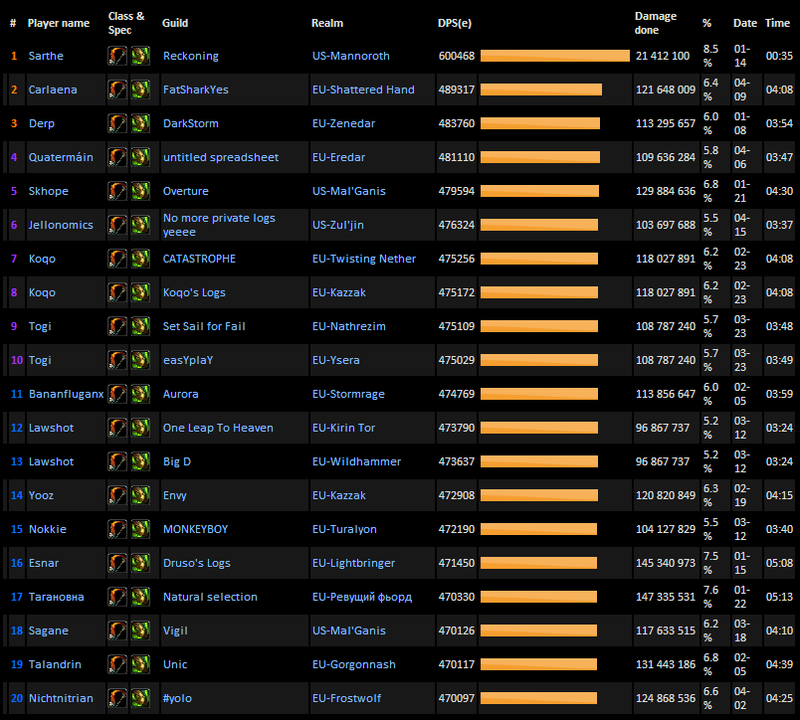 There should be a significant reward in DPS for playing your spec correctly. That is to say, if you play Beast Mastery, and you can get your Kill Command count equal to (seconds played/6), the game should reward you with more dps than someone who has to hit a cobra shot when their Kill Command is off cooldown because they don't have enough focus. For Survival, our signature shot isn't as powerful as Beast Mastery or Marksman, because we get so many more of them with Lock and Load. But it should still be a slight dps increase to hit your ES precisely when it comes off of CD. And, more importantly, it should be a DPS increase to hit your ES immediately when LnL procs, and keep using other shots for a couple GCDs until you notice LnL. Neglecting the top parse (which is a silly, cheese parse of only 35 seconds) every hunter in the top 5 had at least 2 different times when LnL proc'ed and they kept doing something else (oddly, casting a cobra shot seems the most popular thing to do right after LnL procs), delaying their explosive shots. So as far as getting top parses goes, you might draw the conclusion that hitting your rotation "correctly" isn't that important. The reality is, right now, it isn't. At the moment all of the hunter signature shots don't hit sufficiently harder than our filler shots. So you end up with a situation where it tends to be more important to get off the most shots, rather than getting off the right shots. To me, that isn't a problem in and of itself. The best hunters should be getting of the most shots as well as the right shots, so it would still be rewarding good play, except for the letters RPPM. In case you're unaware, RPPM stands for Real Procs Per Minute. It's basically a mathematical formula to determine how often certain trinkets or other abilities (like your legendary cloak or meta gem) will proc. What it does to the game is makes us reliant on luck; on randomness; on good ol' RNGesus. While RNG makes for fine game-play in certain instances, when you could get on hunter with the exact same gear and rotation might get 10 trinket procs while another hunter might get only 4 in the same fight, we're talking about a very significant amount of DPS. An amount which skill cannot make up for. Survival is taking the brunt of this, because of our current 4-piece set bonus. If you don't get an LnL proc in the first few seconds of the fight while both trinkets, your pre-pot and your scope are all up, you can pretty much say goodbye to doing well that fight. Except, you might get incredibly lucky and get a huge chain while Dextrous and Vicious are up at some later point in the fight. Who knows what will happen! Anyhow... sorry to get all rant-y. There are certainly lots of things you can do to improve your dps. I'm not at all saying that anyone should give up and just not try to do the best possible; we can all still get better. It would be nice to have a little more reward for doing better. If you're interested in improving your dps, check out Ricket's Guide here, or Kripparian's here. For more on how to parse, and how outside events affect your DPS, check out Ricket's video here.